For reasons I”m not quite sure of, I occasionally get asked if I would like to feature a recipe from Chef François Payard. Not that I am alone in that invitation I’m sure but when a recipe not in one of Chef Payard’s books is offered to me, I feel both honored and certainly intrigued. I’m not a baking blog or a chocolate blog but more of an ‘all things blog’ with an emphasis on cocktails so while the reason is not clear the fact is that I’m always game; his recipes have never failed me yet and I loved the sound of this Chocolate Pecan Tart. That being said, this recipe was a bit confounding and when you say that about a recipe from a master you sort of scrunch into your seat and wait for the angels to come visit you and set your head straight. But it’s true and as a result I had to make some big revisions. I first made it several weeks ago during the holidays after I was invited to join some friends for dinner. The plan was to make a tart, take some photos and then carry my goodies with me to their house. It all happened save for the photos; I simply ran out of time. The response to the dessert was so positive that I thought it worth doing again and figuring out exactly how to right the filling snafu. And what was up was WAY too much filling. As in double what is required. This time around I decided to make individual tarts for Valentine’s Day and had the opportunity to measure exactly how much of the liquid filling I needed and it was literally half the amount that this recipe makes. That is a LOT of extra filling. So, do I recommend that you cut the amounts in half or that you make two tarts? I opted for the latter; this is a rich and wonderful treat but I can’t imagine needing two of them unless you’re serving a crowd. Although I baked and gave my neighbors individual tarts this week, I’ve kept the recipe written for a single larger tart thinking that most of my readers would find that easier to manage…heck, I had to spend a half hour finding the little tart bakers that I knew I had but couldn’t figure out where they were stored! Do you love my little heart decorations? I just took some scrap dough and cut out little circles; I notched an edge for the top and then trimmed just a bit off each side at the bottom before using my fingers to round off the edges and make an exaggerated point at the bottom. Some red sugar and a couple of minutes in the oven and you’ve got hearts to decorate your tart with…easy as, well, pie! Serve this with some nice port; it makes a beautiful dessert for your Valentine or your entire family! Dough for one tart shell (The recipe called for Pate Brisee but use any pie crust recipe you prefer - I used packaged dough for one of my tests and it was fine too). Boil the water and the sugar together to make a simple syrup. Place the pecans in a bowl and toss with the syrup. Place on a sheet pan and bake for five minute segments in an oven set at 350F or until the pecans are candied and golden brown. Let cool. Scatter the candied pecans and the chocolate into the tart shell. Pour the filling on top of the chocolate and nuts (should be about 3/4 full). Bake for about 30 min in an oven set at 350F. 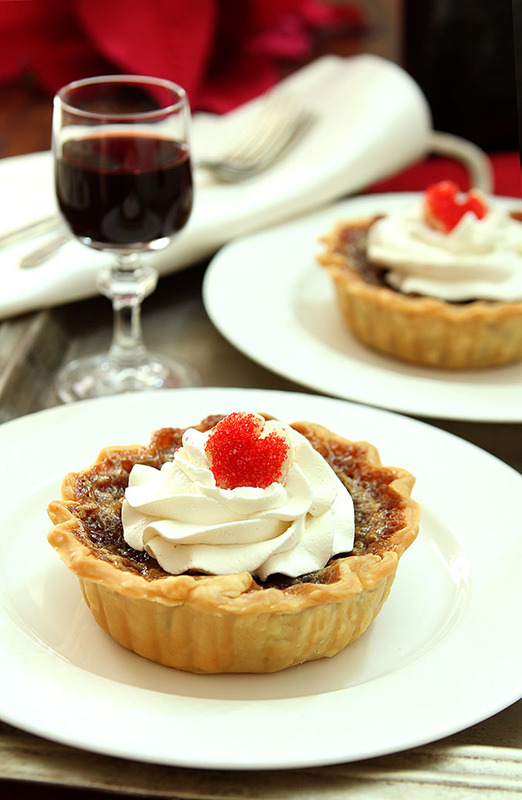 The tart shell should have a golden color and the filling should still be soft in the middle. Remove the tart from the oven and set it aside to cool. Serve warm with whipped cream or ice cream. Not sure why, but I’m definitely more tempted for the glass of wine in the background than the tart itself. Ha! Would it matter if I told you I use 3 Buck Chuck for photo shoots? Trust me, the tart is way better! These are the perfect dessert Barb! So pretty and I know they must be delicious. What a super-cute dessert, I just love it! 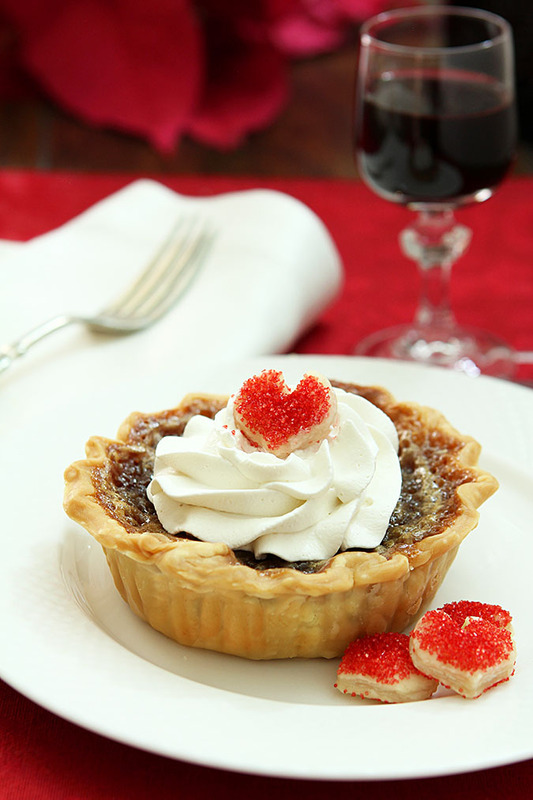 Your little dough hearts are the cutest and a great little finishing garnish to these wonderful looking tarts. Thanks so much Paula; they were sparked by having some dough scraps and a feeling the pie needed a Valentine touch…was a win win all the way around plus I love pie dough cookies! Yup, those little hearts are CUTE! This looks like a great recipe. I’d also not cut in half, but make more little tarts. Or these little beauties, plus a larger tart.